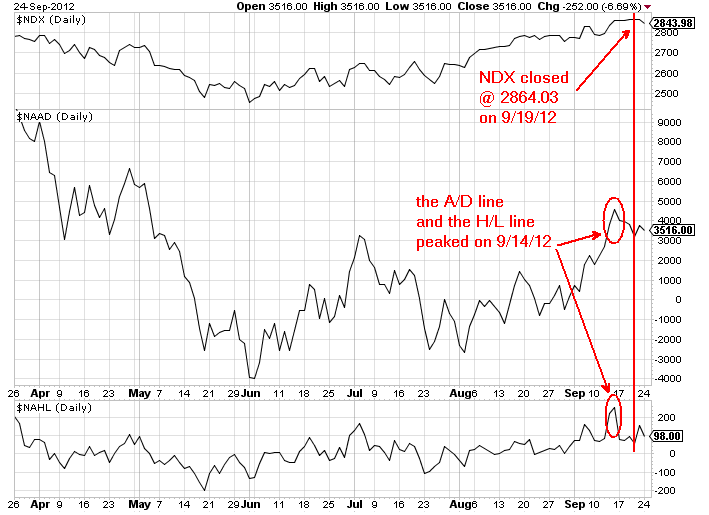 The market has a very subtle way for signaling a change in its major trend direction. Sometimes it will set off the alarm using the Dow Theory and other times it will set off divergence amongst the market indices. Recently, the latter was the method the market has decided to use for signaling it has reached an intermediate top and it is preparing to change direction. 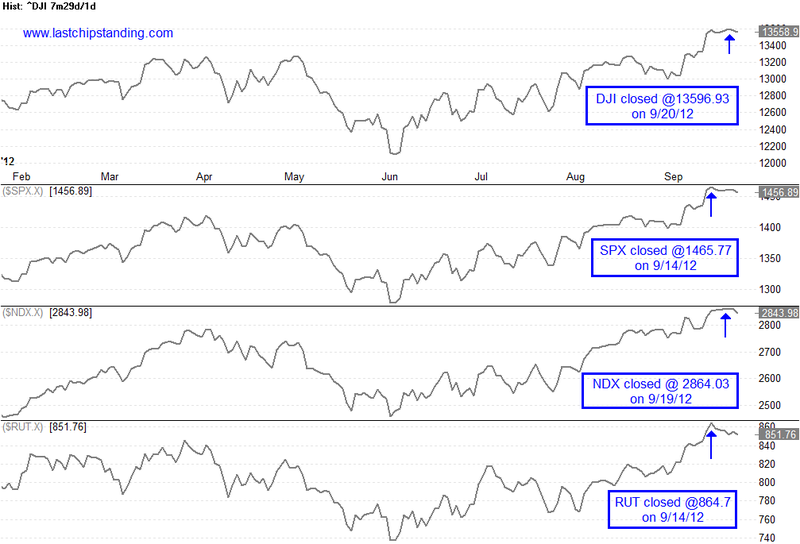 Here is a chart showing how the divergence occurred, notice the new 52 week closing high for the DJIA, SP500, Nasdaq 100 and the Russell 2000 did not occur on the same date. 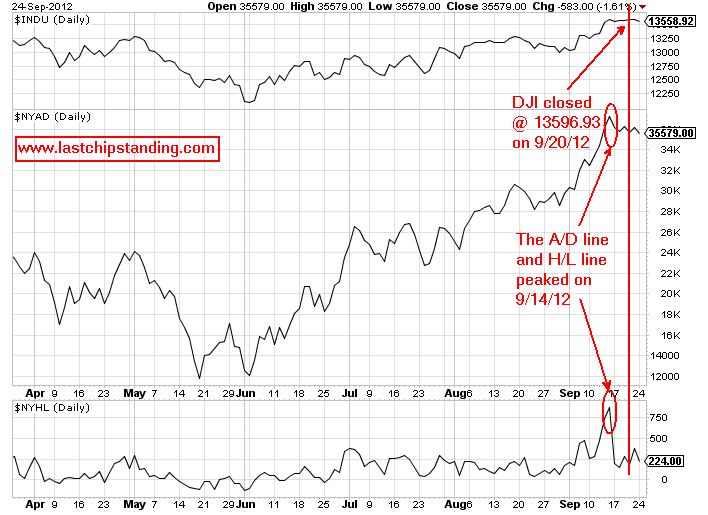 Furthermore, the SP500, Nasdaq 100 and Russell 2000 have peaked before the DJIA reach its peak on 9/20/2012. 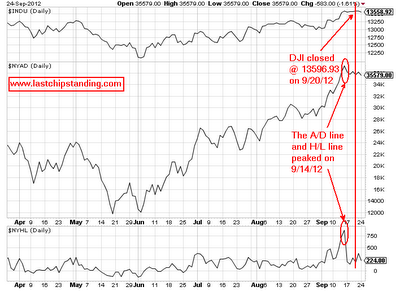 This indicates the DJIA made a new non-confirmed 52 week closing high on 9/20/2012. Similarly for the DJIA, the New York Stock Exchange advance/decline line and the daily net new high-new low indicator peaked on 9/14/2012 and the DJIA made another new 52 week closing high on 9/20/2012. Notice how small the difference between the 9/14/2012 closing high and the 9/20/2012 closing high, it is only 3.56 points (13593.37 vs 13596.93)..subtle! Although the market gave off various divergence and non-confirmation signals, it does not necessary mean an immediate beginning of a new bear market or a big sell off. But it does signal a major correction could be in the offing, and one should be very cautious on initiating new long positions and be very defensive on existing long positions. 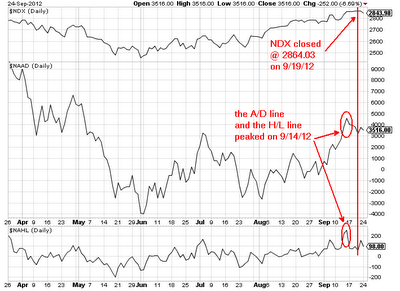 After the market has reached an internal top, a sudden change in direction can happen when it is least expected. Therefore, trade cautiously and defensively until the market establishes a new trend. With lot of talk about possible sell signal for the market due to the non-confirmation between the DJT and DJI recent price level. The Dow Theory is based on the premises that as long as the DJT makes a new high along with the DJI, then the present trend will continue. But if the DJI makes a new high while the DJT does not, then this divergence between the DJI and DJT signal a possible market top. Recently, the DJI made a new 52 week high while the DJT didn't even get above the previous peak which is below it last high. In this video, I explain how to use the Dow Theory along with other market indices to detect a possible market top. If you do not see a video player on your screen, click on the title for this post and it will take you to the blog page where you can view the video. After today's AAPL Iphone 5 announcement, another big day for tomorrow. The Market is expecting QE3 from the Fed tomorrow. Will the Market be right, and will it sell off on the news? Check out the video for possible clues. Here is the video on the financial. And this video on AAPL and FB. Click here if you do not see a video player on your screen. Is It Time For FB To Move Up? Here is a video on FB, and some of the upside possibilities. Click here if you do not see a video player on your screen to view the video. Here are a few video posted during this weekend on the market and some stocks to watch. If you do not see a video player on your screen, click here to watch the video. Here are some price targets for BAC & GS. Watch the video for details. and another video reviewing AAPL and other stocks. 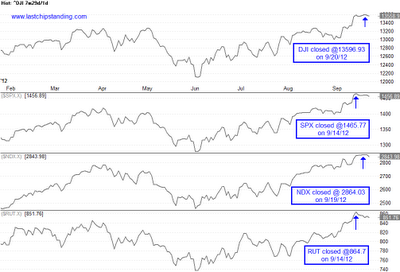 The market continues to consolidate while AAPL is pulling back from its new all time high above 680. Watch the video for market review and AAPL price action review. Click on the title if you do not see the video player on your screen.